Team 1061 places 5th and 1062 places 3rd! October, 2018- Carleton brings the full program to the Richard Calkins Invitational Tournament at Drake University. 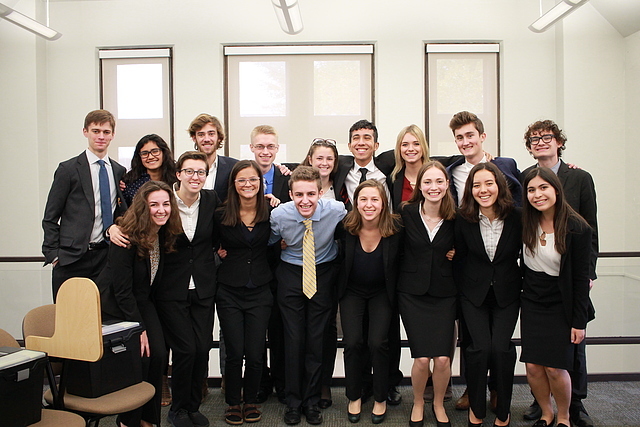 October, 2018- Carleton opens the season competing at the University of Minnesota Nordic Undergraduate Mock Trial Battle. Team 1061 of returning members takes 3rd place in the tournament and Spirit of AMTA. JP Beaty and Courtney Kimmell take home individual awards. October, 2017- Carleton Mock Trial WINS the University of Minnesota Nordic Undergraduate Mock Trial Battle, bringing home the traveling Norse helmet trophy. March, 2017- Returning members of Carleton Mock Trial competes at the Geneva, Il Opening Round Championship series tournament. February, 2017 - Carleton Mock Trial A takes second place at the St. Paul Regionals tournament hosted by Hamline University. November, 2016 - Carleton Mock Trial places third and fifth at the St. Paul Trials, hosted by Hamline University and Macalester College! Elsa Sandeno, JP Beaty, Mickey Forsyth, Ingrid Hofeldt, and Ryan Gorey took home six individual awards! October, 2016 - Carleton Mock Trial placed second at Drake University's invitational over Halloween Weekend! Lucy Friedman-Bell, JP Beaty, and Ryan Gorey win four individual awards! October, 2016 - Carleton Mock Trial receives an honorable mention at University of Minnesota's invitational tournament! JP Beaty and Ryan Gorey take home three individual awards! March, 2016 - Carleton Mock Trial takes home two individual awards from Washington D.C.'s Opening Round Championship Series Tournament! Emily Starr wins Outstanding Attorney award, and Ryan Gorey wins Outstanding Witness award! February, 2016 - Carleton Mock Trial qualifies BOTH teams for Opening Round Championships! Lucy Friedman-Bell wins an Outstanding Witness award. Sharaka Berry wins an Outstanding Witness award. January, 2016 - Carleton Mock Trial takes 1st place at the Hatting Invitational Tournament! Ryan Gorey wins an Outstanding Attorney award. December, 2015 - Carleton Mock Trial ties for fifth at the Queen City Invitational Tournament! Ryan Gorey and Emily Starr win Outstanding Attorney awards. Ryan Gorey wins an Outstanding Witness award. November, 2015 - Carleton Mock Trial takes 1st place at the Ole Open Invitational Tournament! Ryan Gorey, Adam Wiener, and Mary Kate Hall win Outstanding Attorney awards. Jake Kokoris wins Outstanding Witness award. November, 2015 - Carleton Mock Trial competes at the 15th Annual Cornshucker Challenge! Ryan Gorey and Mary Kate Hall win Outstanding Attorney awards. March, 2015 - Carleton Mock Trial competes at Geneva Opening Round Championship Tournament! Mary Kate Hall wins Outstanding Attorney award. Ryan Gorey wins Outstanding Witness award. February, 2015 - Carleton Mock Trial places 3rd at the St. Paul Regional Competition! Suhail Thandi wins All Region Witness award. Emily Starr wins All Region Attorney award.